Cary, NC – There are a variety of flavors and foods in Eastern Europe and the Mediterranean but they cannot always be found at the grocery store. But a new market opening on Maynard Road will let shoppers try these European foods. 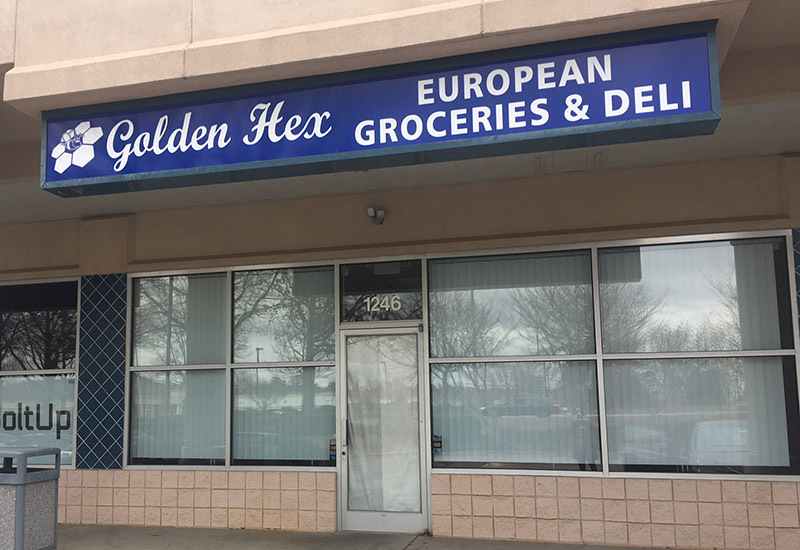 Golden Hex European Groceries & Deli, opening in early March on NW Maynard Road, will feature groceries from around the Eastern Europe and Mediterranean region. This fits the tastes of owner Arthur Schwartz, who has lived in Armenia, Russia, Ukraine and Israel before eventually making it here to Cary. “It will give people the feeling of this homeland,” Schwartz said. The walls of the store are decorated with the various foods sold there, including sausages and cheeses from Eastern Europe, cured and marinated fish from the Baltic region and Scandinavia and a variety of groceries from the Mediterranean, as well as candies and cakes from all across the continent. Golden Hex, owned by Schwartz and his brother Erik, started as a business for bee-products made naturally so the new store in Cary will also carry honey as well as products made from beeswax. Customers in search of new foods and drinks will be able to explore the shelves at Golden Hex, including wine from Schwartz’s homeland of Armenia. “Armenia is known for wines but they don’t have as much recognition here,” Schwartz said. This includes wine made from pomegranates and Schwartz said their selection of European beers and wines will expand from there. Customers can also find Russian dumplings and pierogis, not only for sale to make at home but also at their deli. The deli will include sausages, cheese and frankfurters. Additionally, there will be a variety of caviar and pickled foods, which are popular in Russia and Eastern Europe. Golden Hex European Groceries & Deli is located at 1246 NW Maynard Rd. Thank you so much for the wonderful coverage! Golden Hex will be opening this weekend to the community. For all the further info please follow updates on our website http://goldenhex.com, Facebook page http://facebook.com/GoldenHex, Instagram http://instagram.com/GoldenHexFoods and twitter.com/GoldenHexFoods.